Judgement of London organisers, 67 Pall Mall and importer The Finest Bubble, invited me to judge as a professional at the second edition of the event, in November 2018. 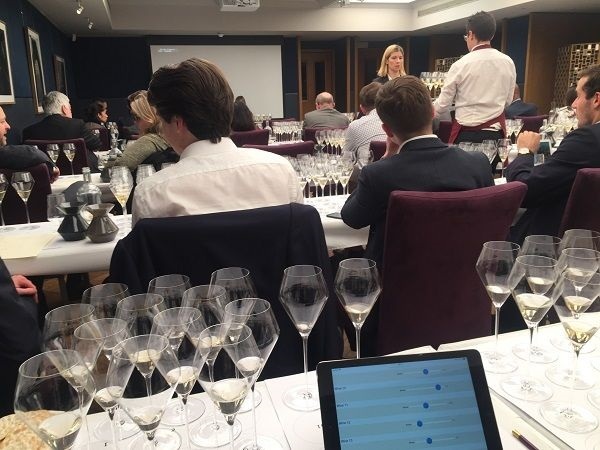 9 MWs and 2 MSs sat alongside 25 amateur members of 67, to score sparkling wines blind – half of them English and half of them Champagne – in a parallel to the 1976 Judgement of Paris tasting that pitted California Cabernets and Chardonnays against French originals. The format was 24 wines, split into 3 flights: Non-vintage, Vintage and Rosé. All we knew was the category and that, within each flight of 8 wines, 4 were Champagne and 4 English sparkling wines. We did not know which producers or wines were included. We then just scored each wine out of 20 and those scores were automatically aggregated for an aggregate view – the entire audience overall, and then split into Pros and Amateurs. Jancis Robinson MW introduced and compèred the proceedings. In her preamble, one aspect she particularly called-out was that she expected it to be a lot more difficult to identify the English wines in the line-ups, since quality had advanced far enough that acidity was just not a distinguishing enough marker. In that latter point, she was right – acidity alone is no longer a consistently reliable marker. However, a combination of 3 factors did tend to reveal the English. I spotted correctly precisely 3 out of 4 wines in each flight. Likewise, fellow MWs Justin Howard-Sneyd and Beverley Blanning picked 4 from 4 in at least one flight each. Those factors were still the classic, piercing acidity in some cases, a slight lack of quality in others, with the 3rd character being a marked orchard fruit aromatic profile – ripe, fresh yellow apple and pear – sometimes with a hedgerow leafy note. The Judgement of London verdict? Overall, for me, Champagnes tended to dominate the finest wines as they generally did for the group scoring (though with a much more compressed range as a result of averaging across 36 people). With a certain degree of deliberately stretching my own scoring perhaps adding +0.5 / 20 to it, Dom Pérignon 2009 stole the show at 19 / 20 (OK, probably 18.5 is a better reflection of the wine), with its bold, yet complex, leesy nose and brisk palate with effortless length. Krug Special Cuvée NV was pretty good too, topping the Non-vintage flight, with Dom Ruinart Rosé 2004 the pick of the relatively lower-quality rosé flight. That is not to say that English wines somehow failed or were bad. Kudos in particular to Coates & Seely for La Perfide Blanc de Blancs 2009, whose finesse took it to being one of my top 3 wines. There were other very good showings, including Nyetimber’s 1086 2009, their new über-cuvée (which is priced as such…), with the equivalent Rosé not too bad. And a couple of Champagnes underwhelmed: for me Comtes de Champagne 2006 was good but not great; for the group, Louis Roederer 2006 was also a little underwhelming and I probably expected a bit more too. Nevertheless, the Champagnes tended to lead the table overall with English tending to bring up the rear more often than not. On reveal of the wines, with big guns like Jacques Selosse, Krug, Comtes, the pair of Doms and so on, a debate ensued about whether or not it was a fair, like-for-like comparison. After a lengthy discussion, I reminded the group that the original Judgement of Paris had put Napa’s nascent industry up against Bordeaux First growths like Château Latour, and the pinnacle of white Burgundy, Montrachet. The London line-up was therefore an appropriate test for English sparkling. The tasting notes and scores below are in the order tasted, with my scores what I noted down on paper (hopefully these correspond with what I actually submitted!). We were also given the overall average scores for the group, which are noted alongside each wine, and the difference between me and the group. Our brief tasting notes were not part of the Judgement of London process. P: Quite frothy. Loose knit. Nutty-bready lees. Some old oak? N: Oxidative. Mushroom and old cream. Dried strawberry and bruised stone fruit. Brioche. Oak?